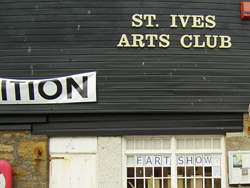 St Ives is renowned for the number of galleries and resident artists in town, particularly non-figurative (or "modern") art. The best know is probably the Tate St Ives, which is worth a visit for its architecture and spectacular location on Porthmeor Beach alone. Exhibitions vary throughout the year and they also stage talks and other events including live music. 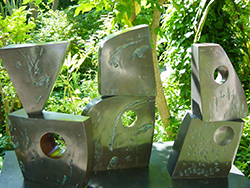 The Barbara Hepworth Sculpture Garden is also a worth seeing, a haven of peace, particularly on busy days in the town. It has many examples of her work and her studio has been left exactly as it was on the day she died. St Ives School of Painting, in the historic Porthmeor Studios complex offers a range of classes and courses in various media. These last anything from half a day to a week. You need to book for the longer courses, but most of their short classes are on a "walk in" basis. There are a host of smaller galleries featuring everything from traditional maritime art through toleading edge modern art. Jo's work includes weaving, felt making, beading, knitting, fabric dyeing, silk velvet, rag rugging, paper making and space dyed threads. She runs workshops for both adults and children, in libraries, schools and community centres around Cornwall. She also runs classes for small groups and offers individual tuition in textile techniques. She is a great teacher and says - "My aim, in my workshops is to inspire people to explore their creativity and create textile art of their own." She undertakes commissions and supplies work to galleries and shops. 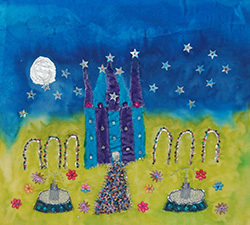 Her website contains details of her textile art workshops and her work. Using acrylics with a limited but vibrant palette, Caroline’s paintings examine and present the subjects that inspire and challenge her - the translucent quality of a cresting wave, the excitement and anticipation of walking to a secret beach reached only by finding a path through a maze of dunes. For the past 15 years she has had her own studio near St Ives and is one of the most well known and successful artists in the area. Her website showcases a selection of her work including seascapes, landscapes and abstracts inspired by the cosatline of West Cornwall. She also undertakes commissions. 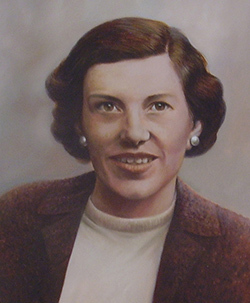 Julia is one of the few specialist portrait artists in St Ives. 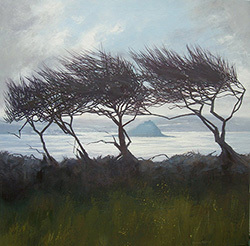 She welcomes commissions and can produce portraits in oils on canvas or pencil on paper. Her portraits of people can be produced from a sitting or a good quality photograph - so if you are not in St Ives you can still commission a wonderful family portrait. She can produce paintings for special occasions such as weddings and anniversaries. She also undertakes animal portraits - specialising in horses, dogs and cats. Her website has a full portfolio to show you the range of work that she can produce. 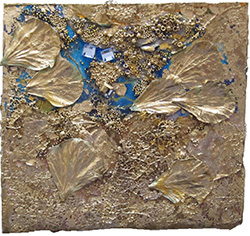 The gold, occasionally copper, used for decorative fine lines and marks are often the distinctive signs of a painting or collage of an Angela Diggle work. A collage using hydrangea heads or a cat looking out to watch a fantastic sunset from the safety of a window ledge may glisten with gold touches and the poppies which often feature in her paintings can be outlined in gold. You can find Angela in The Sloop Craft Market - a short distance from St Ives harbour. 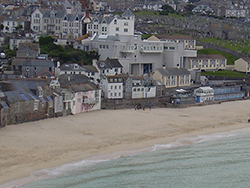 The town's own world class gallery located in an amazing setting on Porthmeor Beach. Exhibitions change through the year with a mixture of St Ives artists and works from the Tate collection. They also run a programme of talks, classes, music and other events. Whether you enjoy the art is a matter of taste and depends on the current exhibition. In any case it is worth visiting just for the stunning architecture and setting. You can enter the shop, cafe and roof terrace for free if you want to just enjoy the architecture and stunning views over Porthmeor Beach. 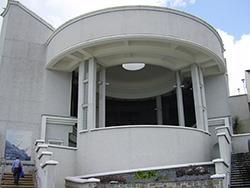 Hepworth, who died in 1975, asked in her will that Trewyn Studios and the adjacent garden, with a group of her sculptures placed as she wished, be permanently open to the public. Visiting the Museum and Garden is a unique experience, which gives remarkable insight into the work and outlook of one of Britain's most important twentieth-century artists. The sculptures are quite stunning and represent a cross section of Hepworth's work. You can see how it evolved from her early days through to her time in St Ives. The garden is also a little haven of peace and quiet, a nice place to just sit and chill out or meditate. Belgrave Gallery - modern British contemporary art. Millennium - cutting edge modern art. Seb West Gallery - impressions of St Ives and Cornwall. Would you like a full listing for your gallery here ?